Sr. Scolastica, Sr. Maria Theresa and Sr. Paula. It was really a good experience for all of us. We are happy to share with you all about our experience with our elderly sisters who inspire us by their work and their life. in class V her mother passed away. When she was in 10th Standard she failed, she appeared for the exam again and then she joined the convent, and became a Daughter of St. Paul. One of her brothers died in 1996 and now she has a brother and a sister. I was inspired when She said that she likes reading; this because I too like reading books about Saints. She is happy that God has given her such a beautiful life and she said that her vocation is a gift from God. What inspired me is this; if Sr. Scholastica had not joined the convent then the Daughters of St. Paul may not be flourishing as it is now. She left her house ,brothers and sisters to become the apostle of Christ .She give all her life to God, through lots of sufferings and hardships, she met but she did not give up still continue to spread the word of God to the people. Her patience and hard work makes the mission grow and increase day by day. Even now I can see her enthusiasm in the mission for she never sits idle. Above all, she is prayerful; she gives me good example to love God, to be patience, and to do everything for the glory of God. Thank you! After listening to Sr. Scholatica’s story I was inspired by her and I am proud of Sr. Scholastic because she is the first sister in our congregation and she told me to always pray the novena and also to Our Lady of glory. 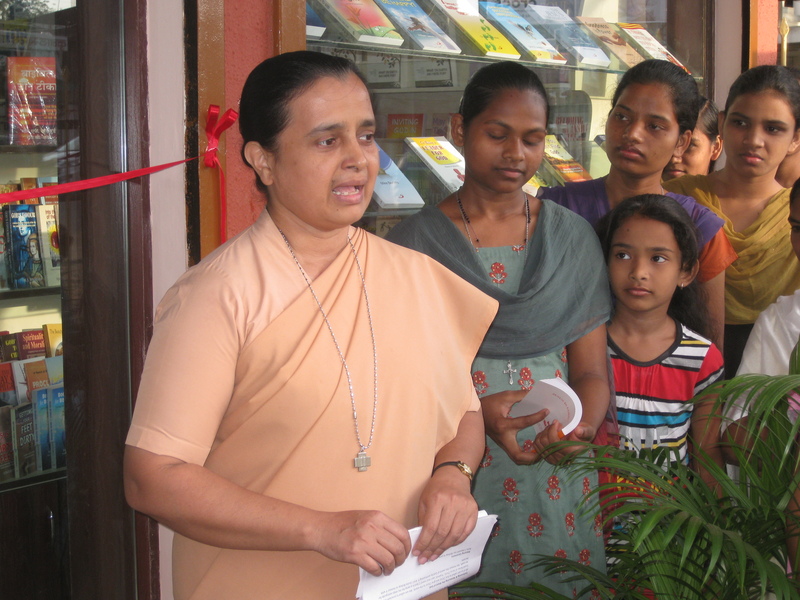 Sr. Scholastica lived in Vile parle (called Villa parlla at that time). It seems her mother promised to God that if she gives birth to a baby girl she would offer to Him. Her mother passed away when she was three years old and from then on her grandparents looked after her. She joined the Daughters of St. Paul in 1951 after her father’s marriage to another woman. She was the first Indian sister and those days there were no sufficient things even to eat. She was sent to Rome, Italy for her postulancy and novitiate. She was kind though she faced lot of trouble. Sr. Scolastica work very hard and she says that we should not say that we cannot do. If we think or say that we cannot do then we cannot do. So we must always learn to say that we can. I believe that Sr Scholastica persevered in her vocation up to this stage because she did whatever she could . Like her I must also work very hard. I must persevere if I face trouble I must fight with patience and persevere till the end. I am grateful to Sr. Scolastica for her courage to say yes to God’s call. 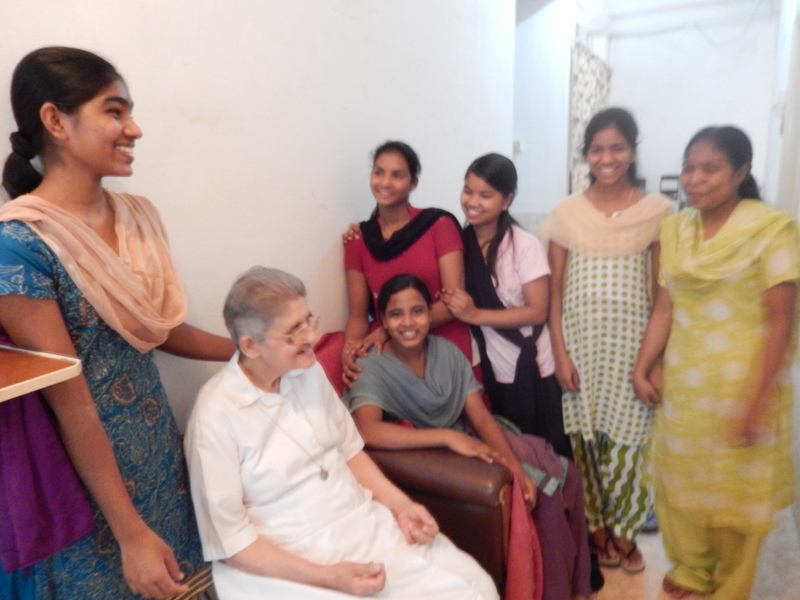 She said that when they heard that our founder Blessed James Albrione was visiting the community of Mumbai, some of our sisters told her that he may tell Sr. Scolatica to go home for she has no vocation. Instead our founder told her to stay she has seen our founder and foundress I am very proud of her because she is the first vocation of the daughters of St. Paul from India her love for the Congregation and for me she is the model for my life. Her faith in God was so strong, she was very prayerful. 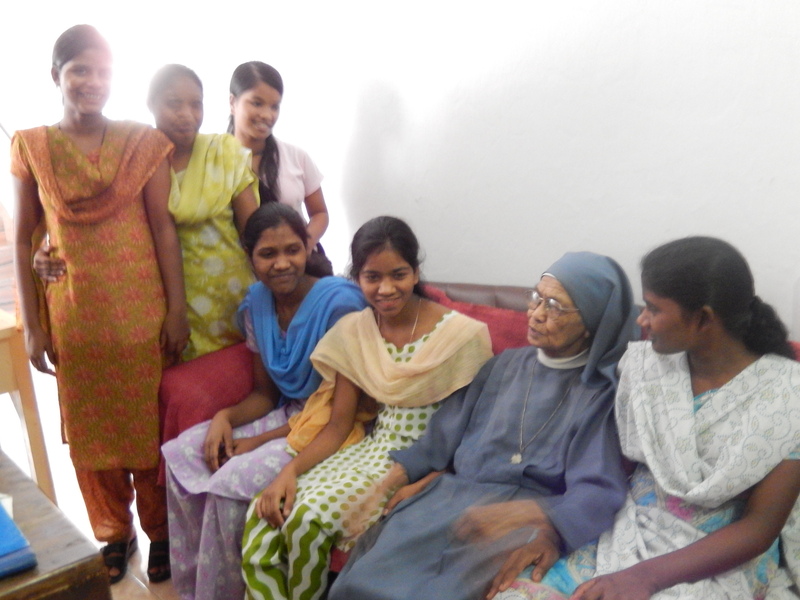 I was inspired by Sr. Paola because she offered her life for God and our Indian people. When she was asked to return back to Philippines she told her provincial that as she has given her life to India she wants to die also in India. She told me that she was very smart she loves our mission very much and she worked very hard for our apostolate. She makes us laugh, she is still strong and active at her old age , and always has a smiling face. I was also inspired by her sharing how our earlier sister’s hard work and sacrificed for our congregation. I was touched when she told many problems faced while traveling for our mission from place to place. She was really a great missionary; it was very hard for all of them she added. In the beginning when she joined there was no house of our own, no food to eat but they were very happy and had great faith in God. 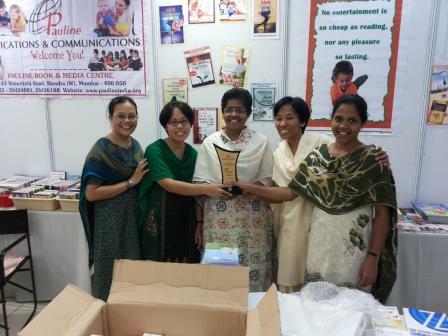 She loves our apostolate very much and her mission was very fruitful by their hard work. Every day she could go to the apostolate and praying for our Indian mission and she felt that she was very close to Jesus. They offered whole-heartedly for the congregation. So we also should love our apostolate like our sisters and have great faith in God, surrender our lives to him and to be patience in our sufferings. Sr. Paola’s mother died 4months after her birth, so she faced lot of problems in her life and study. When she was working in the convent, God called her to work for His people and she responded .She lived such a beautiful life and she inspired me when she said that she will face lot of difficulties and sadness but I will follow Jesus. Sr. Paola asked me why I like our apostolate I told her that I like our apostolate because in this apostolate we do different work everyday. We need to do with concentration because if we make a mistake then all those who read our books will read a thing, that’s why we do the work with much prayer and concentration .Sr.Paula told me to say Rosary even when we went up and down the stare without thinking useless thoughts, do good to others that they may live happily. After the first profession, Sr.Paola asked the superior to send to the country where there are pluralistic religions and she was sent to India the beginning when she came to India she has to work very hard. she like to meet people and talk to them about our mission. She told us that when we go out to sell books ‘you all must talk to them about our mission and the important of reading books because they will forget to read so you should never forget to speak about it. 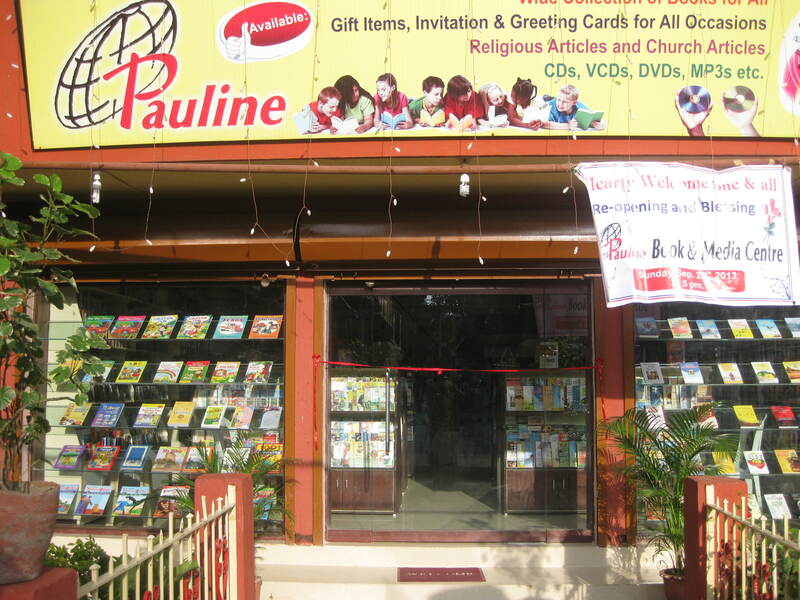 When Sr. Paola went for holidays her provincial asked to remain in Philippines but she refused and told her that she would love to die in India because she had spent all her younger days for the people of India. She joined the Congregation in1959. She is from Mangalore (Kundapur), she joined the congregation after her 10th Standard she is 77 years old. Now she is sick but everyday early in the morning she gets up and joining us for prayer. Sr. Maria Theresa is a very prayerful person, She says, all the four mysteries of Rosaries every day, also makes so many nice rosaries. She said that she also likes cooking, I was inspired by her sharing that she would pray rosary while she was going up and down the stairs when she was in formation like me instead of making useless noise and thinking useless thoughts. She told us to do good to others that they may live happily. She was kept in the for two years in the kitchen and four years in the studio. That means whatever work you get do with love and happiness. After meeting her I am very happy because she told us that nothing is impossible for us, if we want, we can do any work for Jesus and she said never forget to thank Jesus. We need to have courage to say yes, this is the only way we can serve God. I like her ways of doing apostolate and prayer. I like this congregation because I love you Jesus. Sr. Maria Theresa inspired me when she said that she went home for holidays after 8 years of joining the convent, she told us that first of all you have to pray well and come close to our mother Mary if you want to become a good Daughter of St. Paul. Day and night we need to say the Rosary she told us that whatever work you do though it may be small or big you must do with happiness and be happy what you do. I was inspired by her way of life and the hard work that she does. I realized that without hard work we cannot succeed in life and whatever we do we must do for Jesus, everything for God and offer to him. In our life we will face many difficulties and problems but we must be ready to fight for it. Sr. Maria Theresa told us that for a religious prayer life is very important. We have to be very honest with the Lord .During your adult people might go here and there without having in life but we should not do like that way. We have to be courageous in answering his call and we have to think only Jesus and we have to be happy always. This is the only way we can serve God; I was inspired by these words. Sr. Maria is a prayerful person, when she finished her first profession she was put in charge of cooking in the kitchen for two years. 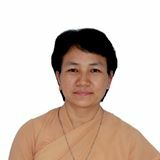 She likes apostolate and those days there were no machine, so they had to work very hard and do well in everything. But now days there are machines and also helpers but still we need to work hard and with love in the apostolate. She told us that Rosary prayer is very important for our life, that’s why we need to pray Rosary everytime.One of her intelligence work is to making a beautiful rosary and giving others to pray even though she is sick and old. I do wish to learn to make Rosary as she does.